Today we are talking about something that we don’t realize we are doing to ourselves and that’s self-sabotage! Now, I’m going to be talking about self-sabotage in marketing but I want you to know that it’s present everywhere in your life! Self-sabotage comes from deep within our roots. It’s those limiting beliefs that have been with us since childhood and they become our normal. I hope that this episode today challenges your beliefs and what you’ve always done so that you can create a new normal! There are 5 ways that I see so many women self-sabotaging their marketing and I’m going to share why they are happening. A lot of women say they want to get visible but they are not actually doing anything to make that happen and here is why. At the core, these women don’t believe that anyone cares about what they have to offer or they are valuable enough. Are you scared of getting the client? I’ve experienced this myself! Maybe you’re scared of getting the clients because suddenly you have to deliver and the pressure is on! This happens because we don’t believe that there are enough of the right clients out there. So, we get desperate and we start taking on anyone and everyone. But, one of the worst things you can do is take on someone that doesn’t value what you offer and fights you every step of the way. This means that we are undervaluing ourselves because we don’t believe we have value or that people will pay for our expertise. When you undercharge or offer a discount, you are saying that you don’t believe what you’re offering is worth anything. Eventually, that attracts the wrong clients and the people who are just after freebies and discounts! Does this sound familiar? You launch a new program and halfway in, you start something else? This is called stopping and starting and so many of you are doing this. You’re doing it because you are not staying in your own lane. You’re comparing yourself to what others are doing and follow that instead! The problem with this is that you don’t really know what's working and what’s not. When you’re stopping and starting, it will be more difficult to figure out why things aren’t working and what you need to do to shift. I talk to so many women that need help and but say that they can’t afford it and have to do themselves. This makes me sad because when you spend all your time doing everything yourself, in turn, you’re keeping yourself stuck. You’re only able to go as much as you’re willing to grow and true growth happens outside our comfort zone. The reason that women aren't investing in themselves or in their business is that they don’t believe that they can make the investment back. It’s not because they think the investment is bad, it’s that they don’t trust themselves to create the results to make back that investment. How do you shift something that has been with you for so long? Here are 3 ways that you can do this! Understand where that self-sabotaging is coming from in the first place. Recognize that this is a choice that you’re making. Start to question the choices that you’re making. Connect with Market Like a Boss! Follow Vroom Communications on Facebook. Continue the conversation in my Facebook Group. 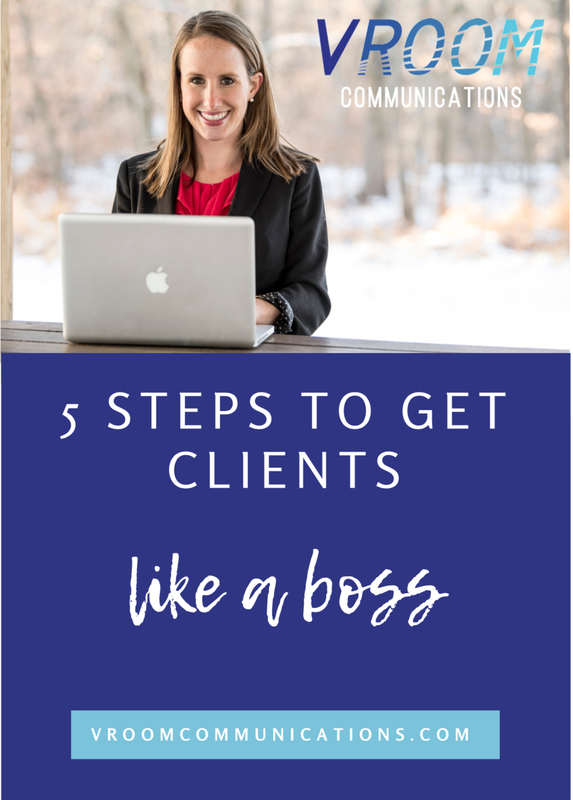 Grab your free guide - 5 Steps to Get Clients Like a Boss. I’d greatly appreciate a podcast rating and review so that I can reach more women!